PROJECT SUMMARY: This project was a combined effort with Next to Nature Landscape Design creating the blueprint for Southern Exposure Landscape Management to install all of the hardscape (patio, seatwalls, firepit, walkways, bar & grill), plantings, mulch and sod. 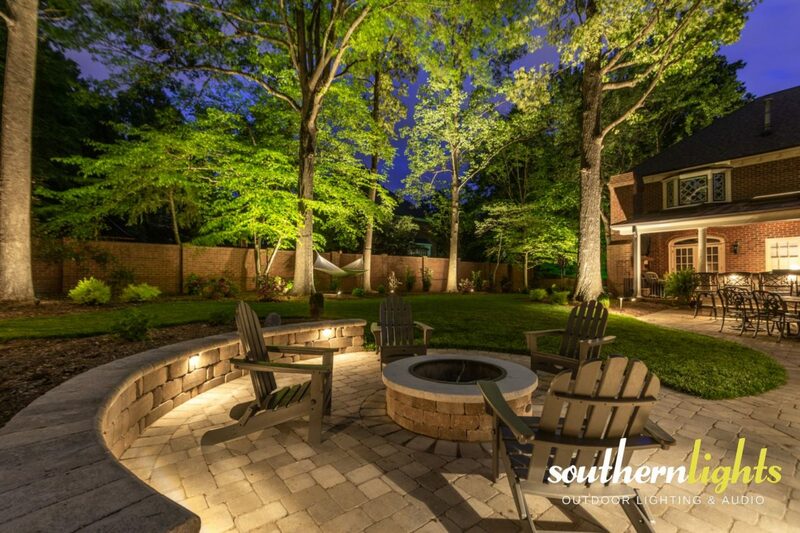 During the design phase, Southern Lights provided the road map and detailed lighting designs for this client capturing this beautiful setting at night creating the most ideal landscape lighting scenes. Client was interested in highlighting the entire property to allow for 360 degree viewing. With the patio, bar, and hot tub, this property was destined to be a party house and needed the addition of landscape lighting to round out the project and allow visitors to enjoy the space day and night. LIGHTING FOCUS: The focus first started with the architectural lighting on the home, creating the backdrop of the lighting design. After the client witnessed the landscape lighting on the front elevations of the home, moving to the backyard was a no-brainer. With the brand new extensive landscape and hardscape investment, lighting was necessary to highlight the beautiful work when our client was home…after the sun goes down. Southern Lights chose to uplight the large trees and brick walls helped to set the balance of the lighting design bringing depth to the composition. Next, came the seatwall, path, and bar lighting illuminating the hardscape surfaces allowing for great ambient light for safety and ambiance. LIGHTING DESIGN: Ideal landscape lighting should evoke Safety. Security. SERENITY and should always start with a design. Initially the lighting system was installed for the front and sides only ensuring the home was secure and safe at night. There was conversation about future work to be done in the backyard, so our lighting designs included a Phase II. The transformer and wire layout was designed and installed in a way that additional fixtures could be added without a major overhaul. The hot tub had a specific need for light when not in it for an aesthetics point of view, but didn’t want to create a glare while inside it. Solution? Southern Lights decided to install a switch allowing the client to turn that section of landscaping lighting off without effecting the rest of the system. Automation to this system was incorporated giving the client full access to their lighting system from a smart phone or tablet. LIGHT FIXTURES: Clarolux Landscape Lighting. Clarolux WL3 “Belmont” PAR36 Well Lights, Clarolux “Turin” Hardscape Light Copper DL4-II. HURDLES TO OVERCOME: Designing an ideal landscape lighting system takes planning. Luckily we didn’t have many hurdles to overcome in this project. Since we were able to work with our client and Southern Exposure during the initial installation of the hardscape walls and bar, we were able to install our light fixtures where we needed them keeping the installation clean and seamless. This client trusted Southern Lights with the lighting designs allowing us to provide the the most ideal landscape lighting effects with the best lighting fixtures for the space and structures.